If you’re getting over a cold or if you have a persistent cough, the Lung point on your hand is awesome. Massaging this point strengthens your Lung qi, which can boost your body’s defenses against colds so that you stop coughing and get over your cold more quickly. How to massage: Press into the point with your thumb pad and massage in a circular motion. Make your way across and down the reflexology area. Massage for 30 to 60 seconds or as directed in the “persistent cough” article. 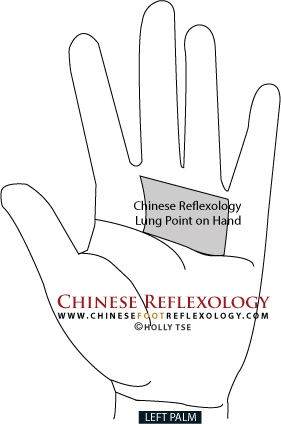 You can substitute this point for the Lung point on the sole of the foot if you are practicing the Chinese Reflexology routine clearing a persistent cough. It’s no coincidence that the points for constipation are #2 in this handy list (bad pun intended). If you ever find yourself temporarily constipated—say due to gross bathroom conditions or tension and nervousness, then there are several Large Intestine points on your left hand that help the poo flow more smoothly. You’ll find full instructions on how to locate and massage these points in this article: Social Anxiety Constipation: Can’t Poo? Here’s What to Do . . . Always massage in ONE direction only as indicated by the arrows. Do not massage back and forth as you’ll be going against the direction that qi (and your poo) is supposed to flow. Think of it like massaging in a CLOCKWISE direction when you are looking at your left palm. This point really should go hand in hand with the Lung point, but I simply couldn’t resist listing the points for constipation as #2. 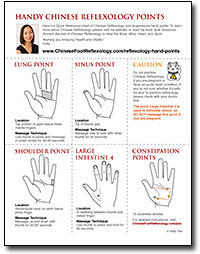 You can massage the hand reflexology point for the sinus in tandem with the Lung point to help unblock your sinuses and clear a stuffy nose. How to massage: Use your other thumb to press on the thumb tip and massage the point using a side-to-side direction (e.g. from the left side of the thumb to the right, and back again). Massage for 30 seconds. The left thumb is for the sinuses in the RIGHT side of the head, and the right thumb is for the sinuses in the LEFT side. Nope, that’s not a typo! 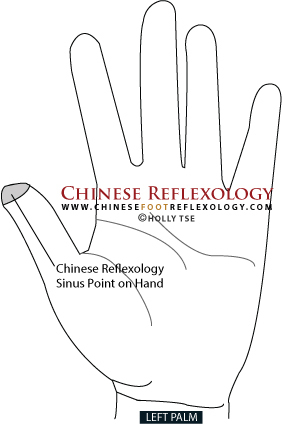 You can substitute this point for the sinus point on the big toe if you are practicing the Chinese Reflexology routine clearing a persistent cough. 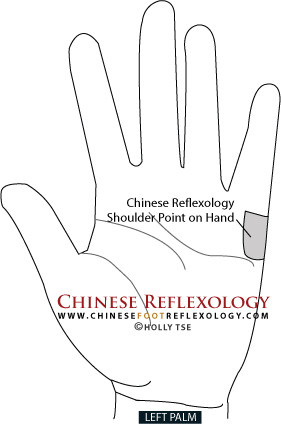 If your shoulders feel tight or if you have shoulder pain, this is a really useful reflexology point. In Chinese Medicine, pain is often due to blocked or stagnant qi and blood, so when you massage the shoulder point, it helps to promote the smooth flow of qi and blood through the shoulder area, which supports healing and can help alleviate pain. How to massage: Use your thumb to press on the point and massage in an up and down direction where up is towards the finger tip and down is towards your wrist. Massage for 30 to 60 seconds up to 3 times a day if you have a shoulder injury. The left hand is for the left shoulder and the right hand is for the right shoulder. This point is actually an acupressure point, but because it’s so powerful and frequently used in acupuncture, I wouldn’t feel right not including this point in this article. 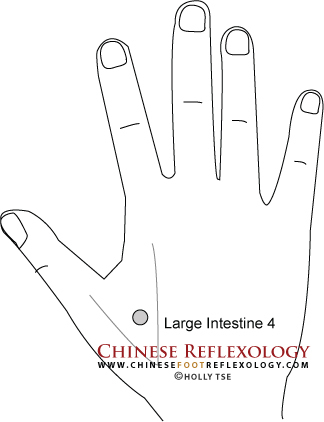 In acupuncture, Large Intestine 4 is used to treat colds, fever, and all types of pain including headaches and menstrual cramps. WARNING: Do not massage this point if you are pregnant. This points powerfully moves qi and should not to be used when pregnant as it can induce labour. How to massage: Press and hold this point with your opposite thumb for 60 seconds. 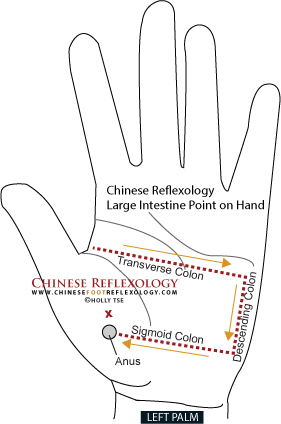 While this is just a sampling of the points on your hand, if you download my free Chinese Reflexology foot chart, you can compare the points on the soles to your hand for an approximate idea of where the hand reflexology points are located. The toes match up with the fingers and the soles with the palms. I do have to say I am a big advocate for massaging the points on your feet. That’s because they’re much more powerful than the ones on your hands. The points on the feet are the master control points for harmonizing and strengthening the qi (life force energy) in your body’s energy meridians. If you find it hard to reach your feet due to a lack of flexibility, gentle stretching every day can increase your range of motion. Practicing the butterfly stretch (described in this article on the Nature of Qi) can help you become more flexible so that you can massage your feet more easily. And if you can’t reach your feet due to an injury, you could also partner up with a friend or family member to trade foot massages. It’s a fun way to learn reflexology and support each other. But if you’re unable to, then you now know some handy hand points. And as I always say: Some reflexology is better than no reflexology! A Handy Gift for You! Get a free Quick Reference chart of the handy points in this article by entering your name and email below. 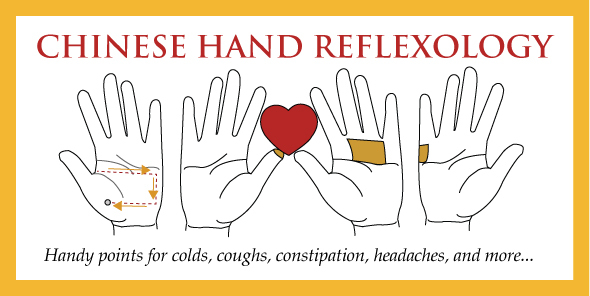 You’ll receive a PDF of the chart, free Chinese Reflexology foot charts, complimentary mini lessons on Chinese Reflexology, and my monthly newsletter. It’s a fun way to learn self-healing tips and techniques for the body, mind, heart, and spirit. I’m having problems registering for the emails, it won’t register me and I love your articles, I have two sons who suffer from sinus daily and not to mention bronchitis every winter. I hope you get my details for subscribing. I’m not sure what’s going on with the email registration. It may be that the website that handles the form was not working when you visited. Unfortunately, no website is ever working 100% of the time! I try to do my best to keep things running, there are a lot of pieces behind the scenes. Try going to the home page to sign up there. There’s a form right at the top next to my picture. I had been practising from the time I first started.Really working well, I am honoured to inform you that my whole family had proved the effectiveness of thi swebsite. God Bless My Home DOCTOR. Thank you for your kind words 🙂 I’m so happy to hear you and your family are practicing regularly and benefiting from Chinese Reflexology. Good for you. Many thanks for this valuable information. At my age, 73, I certainly will benefit with these. Thank-you for all of the GREAT information. thanks Holly for your kindness, and information.